The pontiff, who last week said Marxism "no longer responds to reality," gave a more gentle tweak to his hosts by expressing sympathy for all islanders, including prisoners. "I carry in my heart the just aspirations and legitimate desires of all Cubans, wherever they may be," he said. "Those of the young and the elderly, of adolescents and children, of the sick and workers, of prisoners and their families, and of the poor and those in need." 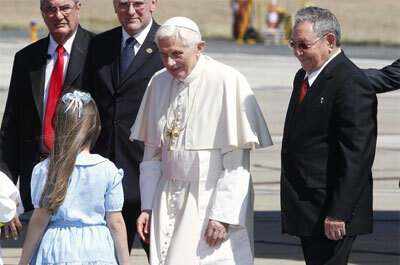 Pope arrives in Cuba, calls for greater freedom, respect for rights (Catholic News Service 3/26/12). 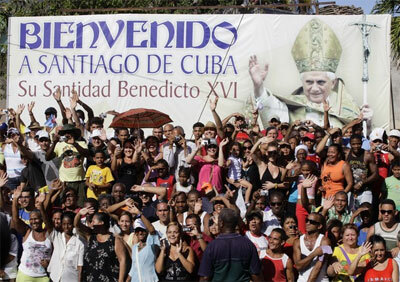 Pope Benedict XVI began his three days in Cuba with a call for greater freedom and human rights, including increased liberty for the Catholic Church to proclaim the Gospel and serve the Cuban people. I Am Here as a Pilgrim of Charity, Pope Tells Cubans: Visits Statue of Beloved Patroness Before Heading to Havana (Zenit 3/27/12). The Church Can Help in Cuba's Renewal To learn about the Church in Cuba, ZENIT spoke with Father Jorge Luis Pérez Soto, a priest of the Archdiocese of San Cristobal of Havana, who lives in Rome and is studying dogmatic theology. (Zenit 3/27/12). Cuban security forces have detained at least 50 people, including many members of the Women in White (Damas de Blanco) movement and an even greater number of dissident political activists on the eve of Pope Benedict’s arrival in this Caribbean island. At least 22 members of the Women in White movement had been arrested by early Sunday afternoon, March 25, sources in the movement confirmed, but that number could increase as other women are determined to attend the papal masses in Santiago de Cuba (March 26) and Havana (March 28). Pope Benedict XVI arrived in Cuba on Monday, declaring himself a “pilgrim of charity” and urging the island to move toward greater openness, freedom and religious devotion. “I am convinced that Cuba, at this moment of particular importance in its history, is already looking to the future, and thus is striving to renew and broaden its horizons,” the pope said. But although Cuba’s president, Raúl Castro, greeted Benedict at the airport here, where he said Cuba’s Constitution guaranteed freedom of religion, that broadening may take some time.